This graph shows that the Insurance Backend category leads the sector with 50 exit events. Its exit activity is more than 1.5 times the next category, Insurance Marketplace, which has 32 exit events. Insurance Backend contains companies that help insurance companies with their day-to-day operations. They include CRMs for insurance agents, communication tools for insurance companies, and claim filing tools for customers. Some example companies are CHSI Connections, ClaimKit, Shift Technology, and Unirisx. 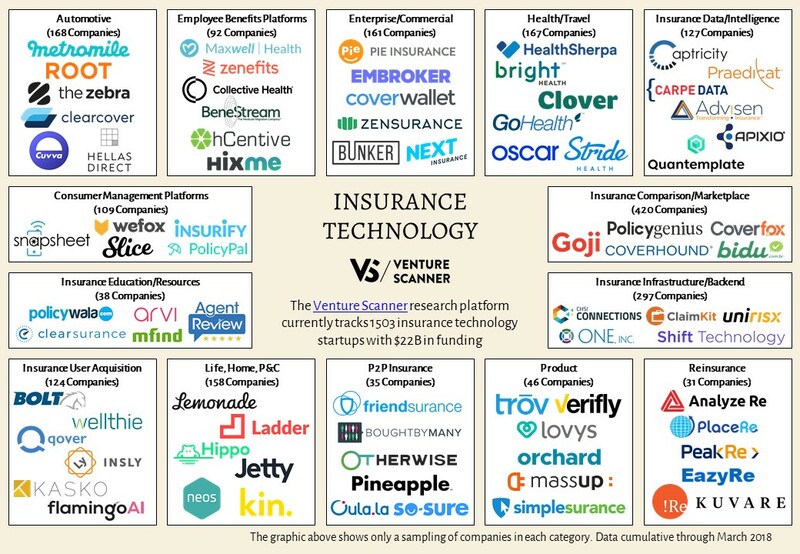 Let’s now see how insurtech categories compare with one another by acquisition amount. 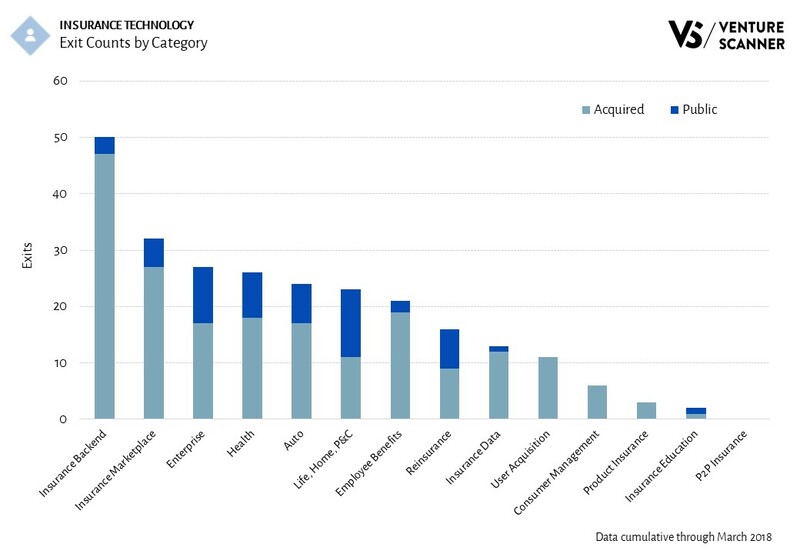 The graph below shows the acquisition amounts in different insurtech categories. We can see from this graph that the Auto Insurance category leads insurtech in total acquisition amount with over $16 billion. Auto Insurance companies offer car insurance and car telematics products. These products generally detect your mileage and driving behavior to customize your insurance plan. Some example companies in this category include Metromile, The Zebra, Clearcover, and Cuvva. Auto Insurance has seen some large acquisitions in recent years. Esurance was acquired by the Allstate Corporation in May 2011 for $1 billion. DriveFactor was acquired by CCC Information Services in May 2015 for $22 million. Tempcover was acquired by Connection Capital in January 2018 for $16 million. The acquisition amount in Auto Insurance represents 30% of all insurtech acquisition activity. It’s noteworthy that its acquisition amount is more than 1.7 times the next category, Enterprise Insurance, which has just under $10 billion. In summary, we have examined insurtech exit activity by the number of exit events and acquisition amount. The Insurance Backend category leads the sector in the number of exit events. The Auto Insurance category leads in acquisition amount. 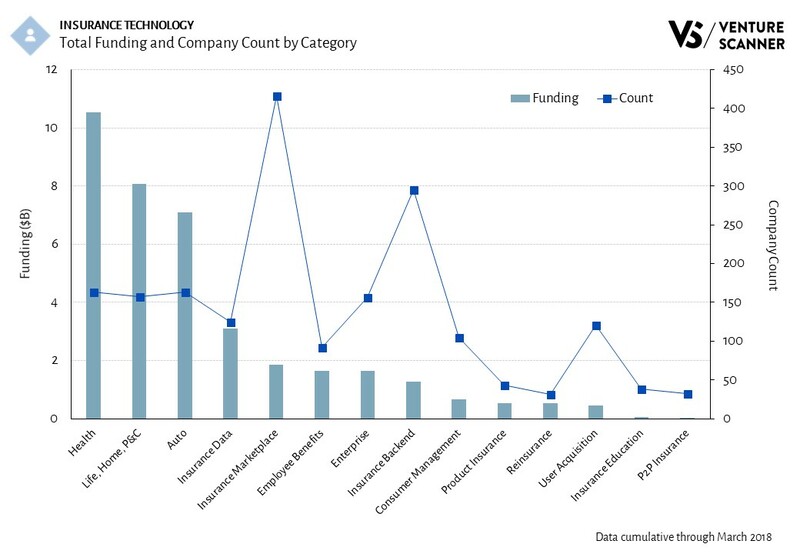 The following infographic summarizes the total funding of all the companies within each Insurance Technology category. You could see that Health Insurance has the highest funding amount at $1.91 Billion, followed by Auto Insurance at $1.12 Billion. 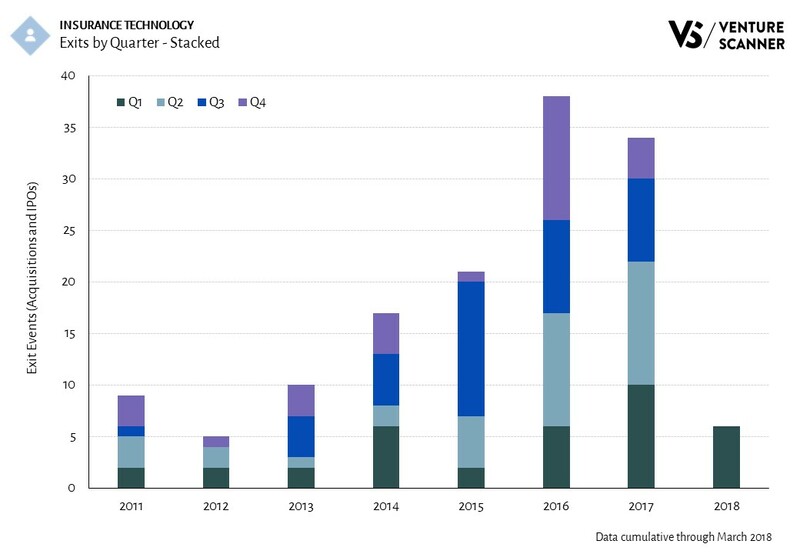 At Venture Scanner, we are currently tracking over 535 Insurance Technology companies in 13 categories across 47 countries, with a total of $4.63 Billion in funding. 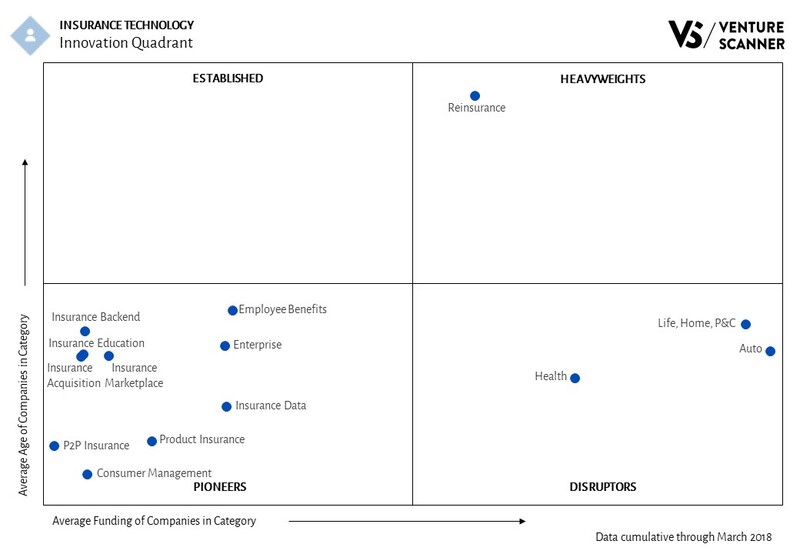 To see the full list of 535 Insurance Technology companies, contact us using the form on www.venturescanner.com. 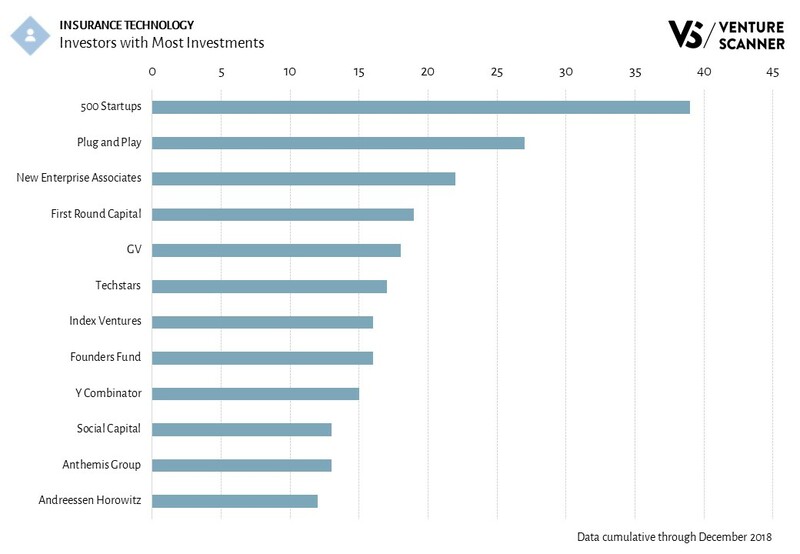 The following infographic summarizes the number of companies invested by the top Insurance Technology investors. You could see that 500 Startups is in the lead by having invested in 6 companies, followed by Y Combinator and First Round which each invested in 5 companies. 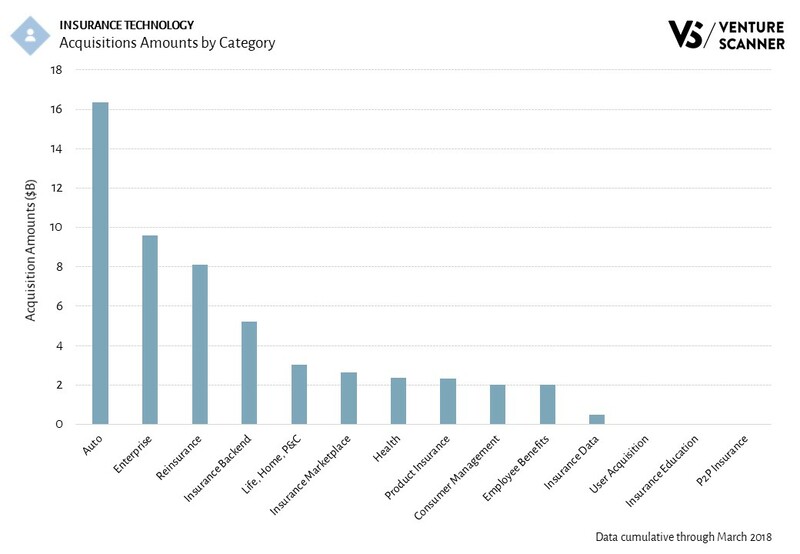 At Venture Scanner, we are currently tracking over 535 Insurance Technology companies in 13 categories across 47 countries, with a total of $4.63 Billion in funding. 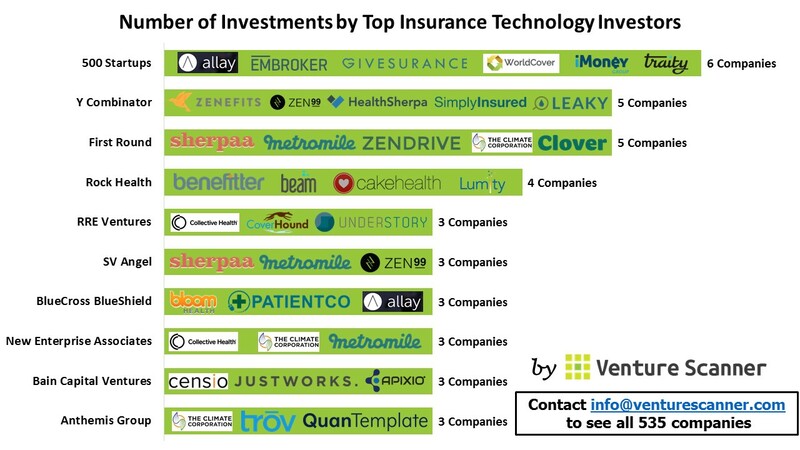 To see the full list of 535 Insurance Technology companies, contact us using the form on www.venturescanner.com.